"Keeping your downtime to a minimum"
At RJ Hydraulics, we understand that a broken pump, motor, cylinder or valve means that a piece of machinery or equipment critical to your business is not in operation. You need a fast and reliable hydraulic repair and sales shop to get you working again. With over 70 years experience and a knowledgeable and well-trained staff, RJ Hydraulics offers reliable service and warranted repairs and rebuilding of hydraulic valves, hydraulic pumps, hydraulic motors, hydraulic cylinders, ball screws and more. 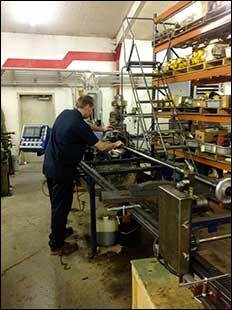 We also offer sales of new hydraulic components as well as custom fabrication of new rods, tubes, glands and pistons. Our valued customers include both local and national companies and individuals. They represent a number of industries including farming, oil refineries, steel mills, construction / paving firms and transportation companies. We also service many small to large size manufacturers including plastic part manufacturers. Our service technicians have expertise working on all major brands including Parker, Vickers, Bosch, Moog, Eaton, Rexroth and more. We also stock a large parts inventory to expedite your hydraulic repairs and hydraulic rebuilds. © RJ Hydraulics Repair. All rights reserved.